Instagram's feature is easy to use, but lacks the selfie lenses and geofilters that make Snapchat so fun. Instagram was once an incredibly basic way to share photos. Put a filter on it, add a caption, done. But the app has become more complex over time. First, there were videos, then direct messages—and that was before ads arrived. Now the app has an algorithmic feed that prevents you from seeing some of your friends’ photos. And Instagram’s newest and boldest feature, Instagram Stories, may seem like a needlessly complex layer on top of all that, but it’s actually Instagram’s way of getting back to basics. Instagram carries a pressure that other social networks don’t. Every photo must be perfectly composed, your feed artfully curated, otherwise you won’t rack up double-digit likes. Quelle horreur! (But seriously, it’s depressing when only a couple followers like your carefully crafted image.) 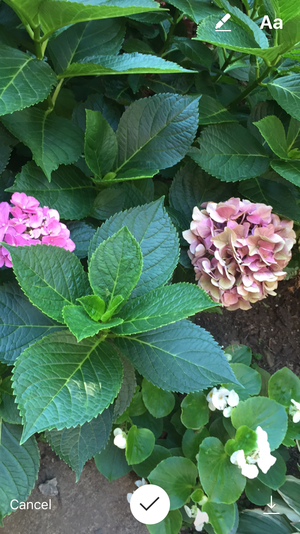 It’s not uncommon for people to use high-end photo-editing apps to add gloss to their images before sharing them to Instagram. Instagram Stories is an off-the-cuff peek into a person’s less-than-perfect life, shamelessly copying Snapchat in the process. No, really. Instagram Stories and Snapchat Stories are identical right down to the name. 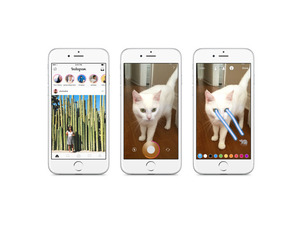 Instagram nails the user interface, though, which could be its winning strategy. If you’re not familiar with Snapchat Stories, Instagram’s new feature will seem completely fresh. It’s a slideshow of photos and videos that you can add to throughout the day, with each addition expiring 24 hours after it was posted. These stories don’t clog up the main Instagram feed, which looks the same as it always did. At the top of the app, you’ll notice a new bar with your friends’ profile photos and a plus sign icon in the top left corner. Tapping on the plus sign lets you create a story, and tapping on a friend’s profile photo lets you view their story. You’ll know a friend has updated their story because a colorful ring will surround their profile photo in the top bar. Adding to your story is fun and fast. When you’re ready to add to your story, think candid. This isn’t an expertly filtered take on life, though you can run your ’gram through a rudimentary filter. You know all those photos you discard before you find the perfect one to post on Instagram? Those are perfect for your story. You have the option to import a photo, video, Boomerang, or Hyperlapse from your Camera Roll (perhaps even an image you already shared to your Snapchat Story), but only what you’ve shot in the last 24 hours. Before posting, you can draw on your image or video, add text, or put an emoji on it. One unique feature Instagram Stories has is a neon text feature. To add a little extra oomph with neon, tap on the marker, then tap on the third option on the right. You can save each addition by tapping the download icon in the bottom right corner, or share it as an Instagram post in your main feed by tapping the three dots in the lower right corner after you’ve shared it to your story. I haven’t been doing that, though, because Stories are supposed to be fun, fast, and far less pressure than a standard Instagram post. Instagram Stories change the game on Instagram, because no one can publicly like or comment on your story. If they want to respond to a ’gram, they can tap “send a message” on the lower left of your post to chat with you directly. This is great for Instagram, because more people will start using Instagram Direct, and great for you, because now you won’t have to measure your worth by likes and comments. Not that you did before. But still. 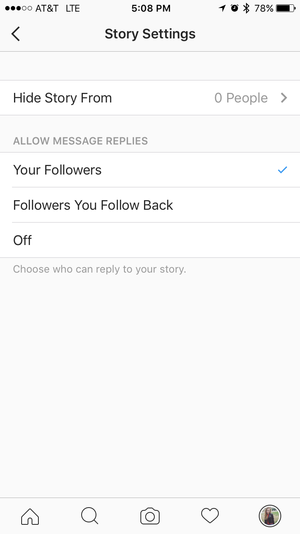 If you don’t want to allow anyone to respond to your story, you can change that setting in the new Story Settings section of the app. The new Story Settings option in the Instagram app. The same privacy settings you have in place for your Instagram account apply to your story, so public accounts will have public stories and stories from private accounts will be limited to that user’s followers. You can further restrict your story by hiding it from specific followers in Story Settings. Instagram has more users (or so we think—Snapchat doesn’t disclose their numbers) and an easier to use app. Anecdotal evidence indicates that many give up on Snapchat because its myriad features are accessible using gestures that aren’t quite clear unless you’ve read a user manual. If you’re already using Instagram, the new Stories format is a bonus. What Instagram and Snapchat will be watching out for is the number of users who use both sets of Stories, or choose one over the other. Snapchat could see a drop in engagement while Instagram’s increases, if Instagram Stories succeeds. One of my favorite bloggers uses both apps for different purposes and bemoaned having to choose between them. There are two things Instagram lacks that makes Snapchat worth using. The first are geofilters, which are fun visual ways to denote where you shot a snap. Brands have gotten in on the act by sponsoring filters, and you can even buy your own on-demand filter for special events like weddings. Then there’s the constantly changing lineup of selfie lenses. The filters are incredibly realistic, not to mention a blast to use, which makes sense because Snapchat has a team of animation experts putting their wizardry to use on those creative lenses. It really shouldn’t be so much fun to add a flower crown to your head or see yourself change into a mermaid, but it is. If Instagram ever reaches that level of creativity, the game will be over.